Increasing the productivity of commercial mussel farms. In the Brancaster area of Norfolk, many people make their living by farming the marine mussel Mytilus edulis. When the mussels are over 50 mm long, and have less than 30 % of their areas covered with barnacles, they are ready for harvesting and sale. We discovered that farmers attempt to increase productivity by employing a number of strategies to accelerate mussel growth and to reduce the coverage of barnacles. For example, farmers may push mussels into deeper water so that they have continued access to food at low tides, and may cover mussels with seaweed to encourage barnacle detachment. However, such management is both labour intensive, and makes harvesting more difficult. We made quantitative assessments of the effectiveness of different management techniques. A cost-benefit analysis was undertaken to assess the economic viability of different management regimes. Deep water Pulmonates from the Miocene Lake Pannon. Sándor Gulyas, ISTVÁN CZICZER and Imre Magyar. University of Szeged, Department of Geology and Paleontology, H-6722 Szeged, Egyetem u. 2-6, Hungary. The late Miocene Lake Pannon is one of the few examples of fossil long-lived lakes. It harboured a very spectacular endemic fauna with multiple sources of origin during its 7 million year history. Following a salinity crisis, many pulmonates including Planorbids and Radix moved into the lake from the surrounding ponds, marshes and rivers, occupying the empty new niches in the lacustrine basin. From the originally small Planorbids, a relatively large species developed, presently determined as Gyraulus tenuistriatus Gorj-Kramb, which conquered deeper parts of the basin. According to seismic profiles of delta systems, these were prodelta silts and clays at a depth of c. 250-300m. These contain a complex deep water assemblage with large bivalves and other gastropods, like the rounded, flat, plate-like Valenciennesius originating from the pulmonate gastropod Radix. The fossil-bearing deep water layers were well-oxygenated, and it might be supposed that the gastropods involved had a special set of deep-water adaptations. However, some authors question the benthic lifestyles implied, and suggest a necton or pseudonecton life pattern for these species. These and other paleoecological questions will be further investigated using isotope geochemical analysis of the shells, and micro mineralogical analysis of embedding sediments. The development of controlled-release micro-capsular toxins as a control strategy for Zebra Mussels. PAUL ELLIOTT, David C. Aldridge and Geoff D. Moggridge. The Zebra Mussel Dreissena polymorpha is well documented as being one of North America’s most significant economic pests, annually causing billions of dollars of damage in industrial water intakes. Manual removal is temporary and expensive, leading to a huge industrial investment in additional preventative measures. The aim of this project is to develop a novel and efficient method for the control of Zebra mussels. We aim to do this by producing toxins encapsulated in edible coatings. These toxic particles can be filtered from the water and concentrated within the mussels’ digestive system, reducing the total quantity of toxin that must be applied. We are engineering the edible coatings to release their payload once inside the mussel, thus avoiding the mussel’s defensive responses. The coatings will also have degradative properties such that upon environmental discharge, the toxin will have leaked out and been diluted to harmless levels. Initial tests look promising. The genetic structure of subdivided populations: a case study using microsatellites in the highly-selfing freshwater snail Bulinus forskalii. JENNIFER L. GOW, Catherine S. Jones, Leslie R. Noble and David Rollinson. Zoology Department, Aberdeen University, Aberdeen AB24 2TZ, UK. Bulinus forskalii is a hermaphroditic freshwater planorbid snail, which has a wide distribution throughout much of tropical Africa. In parts of its range it is the intermediate host for the medically-important trematode Schistosoma intercalatum. The forces acting on the genetics of these subdivided populations were analysed by conducting a survey of variability of eleven microsatellites in B. forskalii populations from Cameroon. Classical genetic parameters ( estimators of H0, HE, FIS ) indicated high levels of heterozygote deficiencies within populations, a result consistent with very high selfing rates. Variable levels of gene diversity within the populations indicate that historical demographic processes, such as bottlenecks or founding events possibly resulting from the isolation and temporary nature of the habitat, may be important determinants of loss of genetic polymorphism within populations. The high level of population differentiation detected suggests limited effective dispersal is occurring and genetic drift is playing a dominant role in shaping population structure. Intraspecific variation of Gyraulus (Gyraulus) varians varians Fuchs from the Miocene Lake Pannon. In the species Gyraulus (Gyraulus) varians varians Fuchs, originally described from Radmanest, there is a large-scale variation in shell form and ornamentation. This large variance in form has suggested the presence of several taxa, Brusina (1902) separated a small, less decorated form as Planorbis lendli Brusina – possibly a juvenile form – on the basis of a single specimen within this variable group. Variance in form has been quantified by outline analysis (EFA) of the forms in 2 dimensions from two localities, Radmanest and Tihany. Size was determined with traditional morphometric measurements (H/W). Other parameters quantifying keel and striation numbers, the angle of aperture deflection and inset of apex and umbilicus have also been used. Total morphological variance was analysed with relevant multivariate methods: PCA and DA. The results of these support our hypothesis that despite the scale of variation, we are dealing with a single species undergoing a gradual transition from early (Radmanest) to later (Tihany) forms, involving adaptation to changing conditions. The separation of a small less decorated species by Brusina is not justified. To shed more light on the ecological factors provoking this variation, analysis of shell ultrastructure is being carried out by SEM. Do native freshwater mussels have potential as biofilters? Department of Zoology, Cambridge University, Downing Street, Cambridge CB2 3EJ, UK. Freshwater mussels (Unionidae) occur in most freshwater ecosystems. They may be present at high densities and filter large volumes of water, removing suspended particulate matter. Invading bivalve species, such as Dreissena polymorpha and Corbicula fluminea, have had enormous impacts on freshwater ecosystems in North America, reducing algal concentrations by up to 90%. The role of native freshwater mussels in ecosystems is largely unknown, but may be of similar magnitude. This raises the possibility of artificially increasing mussel densities in waterways with algal problems, and using the mussels as biofilters. In my PhD I aim to assess how feasible this is. Important questions include: can mussels survive in eutrophic waterways? How many mussels are needed to balance algal growth? Is it possible to breed mussels in sufficient numbers for this purpose? Experiments involving translocating mussels to eutrophic waterways, measuring filtration rates, and breeding mussels are being undertaken to answer these questions. The Asian Clam, Corbicula fluminea, in Great Britain. Department of Zoology, Cambridge University, Downing Street, Cambrige CB2 3EJ, UK. Corbicula fluminea, the Asian clam, arrived in Britain approximately five years ago, and has rapidly gained a foothold in one of Europe’s largest and most important wetland areas, the Norfolk Broads. Over the last five decades C. fluminea has had extensive economic and ecological effects in N. America, and its influence on aquatic ecosystems the world over is set to increase following a further rapid range expansion in recent years. In this study, the source of the British C. fluminea population is being determined using molecular genetic techniques. Studies are being carried out to determine how C. fluminea is spreading through the Norfolk Broads and beyond, and the effectiveness of dredging as a control measure is being investigated. C. fluminea has been shown to interact strongly with native predator communities. Wildfowl and fish stomach-content analyses are used in this project to assess the potential of C. fluminea to function as a novel food source, and exclusion studies are used to assess the ability of native predator communities to control C. fluminea density and biomass. 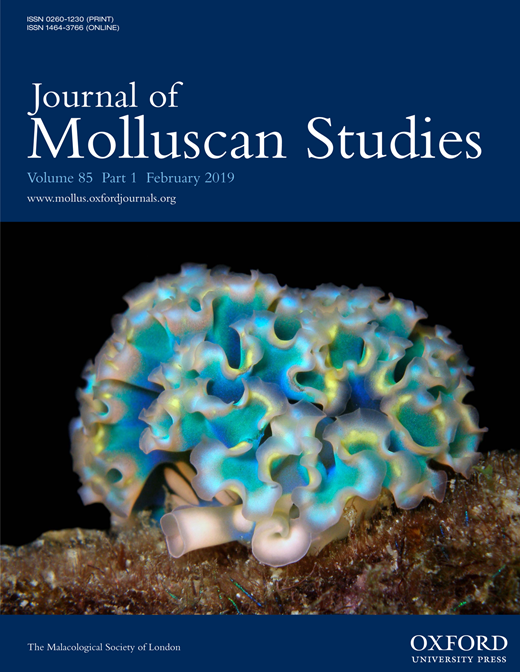 A molecular systematic investigation of the Limatula ovalis/pygmaea species complex (Bivalvia: Limidae) in the Southern Ocean. & The Natural History Museum, Cromwell Road, London, SW7 5BD, UK. The systematic relationship between Limatula ovalis Thiele, 1912 from the high Antarctic, and Limatula pygmaea (Philippi, 1845), from the sub-Antarctic is unclear, given their similar morphology and differing distributions. This phylogenetic relationship was investigated using molecular systematic techniques. Genomic DNA was extracted from a number of Antarctic Limatula species and Polymerase Chain Reaction techniques were employed to amplify three different sequences: 18S nuclear ribosomal rDNA, 16S mitochondrial rDNA and Internal Transcribed Spacer 1 nuclear DNA. Limatula ovalis and L. pygmaea were shown to be sister taxa in all analyses. Limatula hodgsoni (Smith, 1907) was recovered as sister taxon to the L. ovalis/L. pygmaea group, thus supporting the subgeneric taxon Antarctolima. At the lower level, geographically structured populations were evident within both L. ovalis and L. pygmaea. In terms of Antarctic biogeography, the L. ovalis/pygmaea relationship may provide evidence of vicariance due to the formation of the Antarctic Polar Front. In contrast, dispersal may be evident in the geographic structuring of L. pygmaea, in which the Marion Island specimens diverge from the Falkland Island specimens. An interesting divergence was also uncovered within the Marion Island population. Potential reproductive biological explanations of the population divergences are further considered, since, unexpectedly, two brooding L. pygmaea specimens were discovered, in contrast to the rest of the Antarctolima who are thought to have planktonic larvae. The New Caledonian genus Andrefrancia ( Pulmonata: Charopidae) and its anatomical peculiarities. Museum of Natural History, Wroclaw University, Sienkiewicza 21, Wroclaw, Poland. The endemic genus Andrefrancia Solem, 1960 is the most speciose and the least known among New Caledonian charopids. Andrefrancia in its original sense includes 23 nominal species, none of which had ever been anatomically examined. The genus was established by a non-cladist on the basis of shell characters, and thus may turn out to be non-monophyletic. Though a preliminary cladistic analysis, based on characters of male and female genitalia, revealed no synapomorphy that would justify the existence of the genus in its original sense, it made it possible to distinguish a monophyletic group of over ten species. This group is defined by a very bizarre and absolutely unique character found in no other snails. In all these species the epiphallus and/or vas deferens are coiled tightly and regularly around the penial retractor muscle, making from one to more than ten coils. The character seems to have a functional significance; three hypotheses are equally plausible: (1) regulation of the diameter of the vas deferens lumen; (2) participation in spermatophore transfer; (3) injecting spermatozoa into the spermatophore. A preliminary investigation into the effects of the rugosity of a surface on the choices made by by the freshwater snail Biomphalaria glabrata. Department of Science, Christ Church Canterbury University College. C/o: 148 Mongeham Road, Great Mongeham, Deal, Kent CT14 9LL, UK. Experiments were carried out to investigate surfaces of differing rugosity, and on how this affects the choice made by the snail. Rugosity is loosely defined as equivalent to roughness or degree of wrinkling in a surface. In enviromental terms, this property may be of great significance to an organism in the choices it makes, and the scale of rugosity relative to the size of the organism may be important. The rugosity of surfaces is likely to be of particular importance to snails, which cannot fly or jump from the substrate. Investigations were carried out using surfaces varying in rugosity and determining snail choices for resting, for feeding and for the laying of egg masses. Introns: Evolution at a snail’s pace. School of Biology, University of Leeds, Leeds LS2 9JT, UK. Analyses using multiple, independent gene regions can allow a greater understanding of evolutionary history. Our study uses sequence data from a rapidly evolving region of DNA (i.e. non-coding regions, introns) from within the highly conserved calmodulin gene of the inter-tidal snail Littorina. This is one of the best known invertebrate genera in phylogenetic terms, with Reid (1996) having developed a detailed taxonomic analysis, first using morphological and then molecular based cladistic investigations. We aim to gain a clearer picture of what is happening in some of these species, and thereby develop a greater understanding of the evolutionary processes involved. Our studies have revealed a hitherto unsuspected complexity in calmodulin in this genus. Discussed here are the preliminary, incomplete trees highlighting the complicated and intriguing evolutionary nature of the calmodulin gene family and Littorina. Department of Zoology, University of Debrecen, 4010 Debrecen, PO Box 3, Hungary. I measured several size parameters of the Hungarian land snail species, using the figures in Kerney, Cameron and Jungbluth (1984). These included shell height and diameter, aperture height and diameter, umbilical angle and spire angle, all of which were measured by computer from scanned images from the work mentioned. From these parameters, I estimated shell elongation index, aperture elongation index, relative aperture height and diameter, and relative width of the umbilicus. Despite common belief the distribution of shell elongation is not bimodal, but trimodal, and we can discriminate between flattened, moderately tall and very elongated shells. Distributions of aperture elongation, and of the spire and umbilical angles are, however, bimodal. Details of some other patterns in the Hungarian land snail fauna will also be presented. Factors affecting snail density in the East Carpathian forests. Department of Invertebrate Zoology and Hydrobiology, University of Lodz, 12/16 Banacha St, 90-237 Lodz, Poland. Mollusc assemblages were studied quantitatively along an elevation gradient at 11 localities in the mountain forest zone. The vegetation type and cover, topography of the site and soil cover seemed to govern mollusc density in the area. The sites (forest patches of 100m2 each) harbored from 11 to 41 taxa and 18-1346 specimens. To explain the differences in population densities multiple regression models were adopted for the most abundant and frequently collected species (Punctum pygmaeum, Vitrea crystallina, Aegopinella pura, Aegopinella epipedostoma, Macrogastra tumida and Vestia turgida). The total density of mollusc assemblages is positively correlated with pH, vegetation cover and slope, and negatively with altitude. The significance of these factors was found to vary between species. Visiting the Mollusca section at the National Museum of Wales, Cardiff. National Museum and Galleries of Wales, Cathays Park, Cardiff CF10 3NP, UK. The Mollusca Section at NMW, Cardiff holds one of the largest mollusc collections in Europe. Our dry collection, comprising some 380,000 lots, is rich in scientifically and historically important material, and is made up of many different collections. Of particular importance is the Melvill-Tomlin collection that was donated to us in 1955, and contains material from over 850 sources. Our wet collection includes material from many of our recent collecting expeditions. The section has excellent visitor services facilities. Before arriving at the museum, you can browse or search 60% of our collection on the museum website. Whilst using the collection first hand, the user can take advantage of our extensive historical molluscan library, reprint collection and journals. If you are unable to visit in person, we operate a loan service (subject to status). The current projects carried out in the section by our museum staff illustrate how our expertise is used in a variety of areas, ranging from local biodiversity surveys to alpha taxonomy and training projects abroad. We are delighted to welcome Eike Neubert and Paul Pearce-Kelly, who will be providing lectures on the theme of “Aspects of mollusc conservation”.